Reminiscences of Sri Lanka’s foreign policy triumphs spearheaded by the late lamented Lakshman Kadirgamar are fresh in my mind given that it was only the other day (12 April) that we marked the former foreign minister’s 81st birth anniversary. It is, therefore, doubly sad to reflect on the fact that Sri Lanka’s relations with the world outside our shores are in tatters at present. To say that our foreign policy today lacks coherence and depth is to be generous. Had Kadirgamar been our Foreign Minister at the time the short-sighted’victory resolution’ introduced by Sri Lanka at the United Nations Human Rights Council in Geneva in 2009 would not have seen the light of day. His sagacity would have enabled Sri Lanka to avoid the pitfall of playing into the hands of our opponents, a sagacity that characterised our professional diplomacy even before Kadirgamar came on the scene. The first decisions or resolutions on Sri Lanka were adopted by the UNHRC’s predecessor body, the Commission on Human Rights(UNCHR), in 1984 following the disastrous ‘Black July’ of 1983 and the outrage that that awful incident caused both domestically and externally, and later again in 1987, largely on the initiative of India supported by the European Union (EU) and Argentina. The key point we need to remember, however, is that these resolutions were adopted without a vote because the Sri Lankan delegations of 1984 and 1987 ‘with tact and professional diplomacy converted hostile resolutions into benign ones’. The then Canadian representative in Geneva in fact ‘recalled [that] the representative of Sri Lanka had rightly referred to that country’s reputation as a voice of reason, moderation and prudence. His [Sri Lanka's] delegation had laid great stress on the recognition of these qualities’.From 1987 to 2009, Sri Lanka was mentioned in the debates of the Commission on Human Rights(CHR) and the Human Rights Council (HRC) but no resolutions against us were passed in either body. Here, we do need to acknowledge the diplomatic support we received from India in the aftermath of the Indo-Lanka Accord of 1987. It was in 2009 that we were once again at the receiving end of a hostile resolution in Geneva during the last stages of Sri Lanka’s military campaign against the Liberation Tigers of Tamil Eelam (LTTE). This resolution was aggressively opposed by the Sri Lankan delegation. Discretion was not considered the better part of valour by those guiding Sri Lanka’s diplomatic destinies at that time both in Colombo and in Geneva and anti-Western ideology was allowed to trump national interest. Instead of deploying ‘quiet diplomacy’ to turn ‘a hostile resolution into a benign one’, we went in with ‘all our guns blazing’ and initiated a counter resolution (dubbed by critics as a ‘victory resolution’) which was adopted by the UNHRC in a divided vote (29 for and 12 against with 6 abstaining). Included in this ‘victory resolution’ significantly was a promise to implement the 13th Amendment to our Constitution. It is largely the content of this ‘victory resolution’ of 2009 that has come back to haunt us in the resolutions adopted by the UNHRC in 2012 and 2013. After as violent an end to a decades-long war with the Liberation Tigers of Tamil Eelam (LTTE) that Sri Lanka endured, prudent and smart diplomacy demanded that we stay off radar, not willingly get on it. Thanks to the foolhardy diplomatic adventurism of 2009 in Geneva and the excessively self-congratulatory post-war attitudes and non-progressive policies that the ‘victory resolution’ engendered, Sri Lanka is now doomed to remain on the UNHRC agenda for the foreseeable future. The architects of these UNHRC resolutions against Sri Lanka in 2012 and 2013 are two countries — India and the United States, though they supported us to the hilt from 2002 onwards in our battle against the LTTE.India, by the way, voted with Sri Lanka in 2009 for our ‘victory resolution’ as well.Previous policy blunders related to nurturing the LTTE notwithstanding, India supported our conclusive military action to eliminate the LTTE despite the then impending Indian elections of May 2009 and related Tamil Nadu ‘compulsions’. In 2006, the United States had sent a special envoy to Europe on behalf of this very same government led by President Rajapaksa to lobby support for the listing by the European Union of the LTTE as a terrorist outfit. In doing so, the United States had to resist the not inconsiderable Norwegian and the Tamil diaspora-led opposition to this ban on the LTTE.Although the likes of David Miliband (UK) and Bernard Kouchner (France) tried their utmost to initiate international action against us, Sri Lanka was able to ensure that no government took a concerted diplomatic initiative at the UN Security Council to compel Sri Lanka to abort the final military push against the LTTE, something similar to that which India, acting unilaterally, had done in the 1980s by compelling us to halt the Vadamarachchi operation. Transforming these intra-conflict diplomatic assets into post-war diplomatic liabilities has taken some doing and is reflective of our recent foreign policy blunders! This state of affairs indeed is a sad commentary on our post-war diplomacy. Our External Affairs Minister declares emphatically in Parliament that our relations with the United States remain unchanged, that is, we assume, they remain in disarray. Are we to assume that these costly agreements are to keep US-Sri Lanka relations unchanged as Minister G.L. Peiris asserts or is it the case that the responsibility for the maintenance of our relations with Washington is being outsourced? Actions, we know, speak louder than words, even if the words are those of our usually eloquent External Affairs Minister. In fairness to Minister Peiris, it has to be recorded that he is, unlike Foreign Minister Kadirgamar, hamstrung by Monitoring MPs who have not the foggiest about international relations and saddled with ambassadors and high commissioners who know more about selling tea than reading tea leaves! Clearly Sri Lanka’s foreign policy record, post-2009 in particular, leaves much to be desired. Key supporters of Sri Lanka up until 2009 (the foundation for such support was deftly laid by Kadirgamar and our seasoned career diplomats)– India and the United States –are now the leading sponsors of hostile UNHRC resolutions against us. Canada, a government that stood by us solidly in Geneva and elsewhere in 1987 and after, is today critical of ourpost-2009 record. These disagreements over our post-2009 conduct have spilt over into the domain of foreign policy. Canada is now unsupportive of Sri Lanka’s hosting of the Commonwealth Heads of Government Meeting (CHOGM) scheduled for November 2013 whilst Britain has expressed considerable doubts about its level of participation in it. The Commonwealth Ministerial Action Group(CMAG) is scheduled to meet on the 24th of April and indications are that our indefatigable External Affairs Minister is set to dash to London around the time of the CMAG Meeting to attempt damage control. Time was when our Ambassadors and High Commissioners could handle routine matters of this nature. But that was during a time, generally speaking, when square pegs were not placed in round holes as seems to be the case today. Accountability, reconciliation, and the violation of Commonwealth Latimer House Principles as a result of the procedurally flawed and illegal removal of Chief Justice Shirani Bandaranayake are expected to be discussed at the April CMAG meeting. This discussion may have an impact on the next CHOGM, particularly with regard to the location of, and the level of participation at, that meeting. Chances are that the developing member countries of the Commonwealth will support sticking with the venue agreed upon — Colombo. But as to whether the 2013 CHOGM will be well attended at Heads of Government level is uncertain. The precise level of participation of some senior member countries of the Commonwealth is likely to be decided upon only after the deliberations at the CMAG meeting or even after the September sessions of the UNHRC. The key issue the Commonwealth will need to resolve, according to informed sources, is whether or not it will be comfortable with having Sri Lanka as its Chair-in-Office for the two years following the November 2013 CHOGM, were the meeting to go ahead as scheduled. Given Sri Lanka’s parlous track record in the sphere of democratic governance in recent years, we seem toobserve in the breach established Commonwealth principles such as respect for and observation of the rule of law, freedom of expression, independence of the judiciary and the like. Hence having Sri Lanka serve as Chair-in-Office,to put it mildly, may well prove an unenviable burden for the Commonwealth. “The plight of the Tamils in Sri Lanka is close to our hearts. Our support for equal rights and equal protection of the laws to them has been unwavering since the days of Indiraji and Rajivji. Yaswant Sinha on April 3 (as reported in the Indian Express of April 4, 2013) urged Prime Minister Manmohan Singh to skip the CHOGM scheduled to be held in Sri Lanka.’Noting that India is the pivot of the Commonwealth’, in the course of a speech on the predicament of the Tamils of Sri Lanka, Sinha opined that ‘if India does not go there,the CHOGM cannot be held’. Sinha also called for the suspension of Sri Lanka from the Commonwealth by the CMAG for violations of the Harare Declaration. He suggested that India should initiate action to see that Sri Lanka is so suspended. He also called for ‘an India-led resolution at the UNHRC, suggesting Sri Lanka remove all of its Forces from the northern and eastern provinces of the island’. Whilst stating that elections [to the Northern Provincial Council]should be held at the earliest under international supervision, Sinha also went on to say that’there should be an independent inquiry into the atrocities committed against the Tamils’. Be the above dangers as they may, commentators partial to the government of Sri Lanka would have us believe that the socio-political mess we are in today, particularly on the foreign policy front, is thanks to interfering outsiders and not due to any of our sins of commission or omission. Is it really the United States, Canada, Britain, India/Tamil Nadu or any other outsider that is the cause of our post-2009 woes? Are those ‘double standards’ of outsiders opposed to us the cause of all evil that has befallen ‘The Miracle of Asia’ in these post-war years? Would it be incorrect to say that we have been our own worst enemy and that our own ‘double standards’ have hurt us both domestically and internationally? Can we honestly say that our government treats all of our citizens equally under the law of the land and in terms of our Constitution? Are all of us equal before the law or are not some ‘more equal than the others’? Can we honestly claim that the Sri Lankan state treats all Sri Lankan citizens, regardless of ethnicity and religion, in the same way? Do all of our religions receive equal status under our Constitution? We Sri Lankans seem very good at detecting the mote in the eye of others but hopeless at seeing the beam in ours! We make promises to our international partners and colleagues and to our own citizens one moment only to renege on them the next. Can a domestic or foreign policy, especially of a small state, survive such blatant prevarication and perfidy? A favourite argument of the defenders of the state today is that our national sovereignty is not being respected by outsiders and that the principle of non-interference in the internal affairs is not adhered to by certain states.Sovereignty and non-interference in the internal affairs of countries of course are vital principles to be found in the UN Charter. Sovereignty, however, is no longer an absolute value, if ever it was. In this regard, one must ever remember the fundamental point that it is the people that are sovereign not the state. Acceding to the treaties/protocols/conventions may thus enhance the sovereignty of the people whilst possibly undermining the ‘sovereignty’ of the state.In any event, like everything else in geopolitics, sovereignty is also applied or practiced selectively. Try as we might, Sri Lanka will not be able to hide legitimately behind the concept of sovereignty. Each time any Government of Sri Lanka signs a human rights treaty or a new protocol or covenant, we give other countries the right, if need be, to examine our record on human rightsand to question, comment on and review that record. We are a signatory to all major international human rights conventions and we should be justly proud of this record. In 2005 Sri Lanka joined all of the member states in unanimously adopting the Responsibility to Protect(R2P) norm at the 60th anniversary of the UN General Assembly. We agreed to the setting up of the UNHRC in 2006 and with its mandate. We also agreed to the establishment of the Universal Periodic Review (UPR) and the procedure by which it allows individuals and organisations to bring human rights violations to the attention of the UNHRC. Sri Lanka, in keeping with its obligations arising from being a signatory to these UN Conventions, reports periodically on its adherence to these International Human Rights norms. A lack of due transparency makes it difficult for the average citizen to access these reports. This absence of transparency and a lack of free flow of information only make it easier for some of our politicians and certain individuals to dupe the majority of us. The Responsibility to Protect(R2P) normaccepted by consensus at the UN(2005) is conditioned by the requirement of UN Security Council approval for any action to take place. Its purpose is to ensure that humanitarian action is taken in extreme cases of genocide as in Rwanda. Beating the ideological drumto warn our citizens of neo-colonialsm and neo-imperialism is in fact a cover for human rights violations. Let us now examine closely the rhetoric of our politicians and officials alike that vitiates the reality of Sri Lanka’s current predicament. The root cause of the current crisis in Indo-Lanka relations, asserts one observer, is ‘extra regional’ and has ‘nothing to do with the region’. Surely this viewpoint is as much an exaggeration as it is tendentious. Is it entirely or solely the US-led 2013 Geneva resolution that has triggered off violence against Sri Lanka and Sri Lankans in Tamil Nadu? Has Sri Lanka handled Indo-Lanka relations in the post-war years as deftly as we did from 2005 to May 2009? Is it true to say as a prominent official said recently’that protests in Tamil Nadu over accountability issues in Sri Lanka would serve to discourage those pushing for devolution of power under the 13th Amendment to the Constitution’? Sincere and candid answers to the above queries would indicate that Sri Lanka has been less than honest in its dealings with itself as well as with outsiders. By our limited action and inaction since May 2009, we have dilly dallied over our efforts at reconciliation and thereby invited the hostility of friend and foe alike. Long before today’s protests and violence against Sri Lanka/ Sri Lankans in Tamil Nadu came to be, Sri Lanka began playing unsavoury games with the issue of power devolution at home. And nobody of significance in the current government of Sri Lanka is pushing for the implementation of the13th Amendment,so far as we citizens know. What progress has Sri Lanka made in the spheres of rehabilitation and reconstruction? Here I think it is unhelpful to conflate reconstruction and rehabilitation as much as it is unhelpful to conflate accountability and reconciliation.Reconstruction, rehabilitation, accountability and reconciliation are indeed inter-related in the ultimate reckoning. The most daunting and challenging of these fourtasks surely is accountability. In regard to a ccountability I feel the critics of Sri Lanka, both domestic and external, are on uneven ground.Human history bears witness to the tragi-sad fact that at the end of all human conflict, more often than not, a victor’s justice prevails. Sri Lanka’s Permanent Representative at the UN Headquarters in New York has eloquently held forth on this particular theme a few days ago, referring in the process, to post-conflict justice in all of its manifestations quoting, along the way, the Buddha and Shakespeare.The problem in Sri Lanka, however, is not an absence of eloquence of which we have more than our fair share. What we desperately lack is restorative justice. As I see it, what is found in abundance in Sri Lanka post-2009 is a victor’s justice. Examples abound in other parts of the world of instances similar to that in Sri Lanka where the winners failed to look with compassion and justice on the vanquished. Yet these past errors ought not detain us at this juncture except to afford us some fresh perspective to understand the present better and to help us avoid pitfalls arising from such past errors. 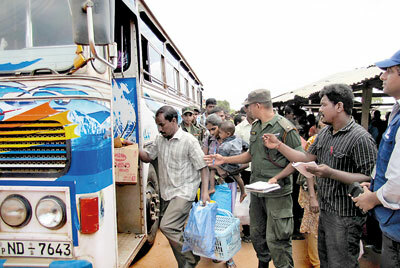 Reconstruction is a priority for Sri Lanka for both humanitarian and practical reasons. The urgent re-building of the war-ravaged north and east is a must. In this endeavour it is best to be guided by the citizens of the area and their elected representatives. To this end, the announcement of plans to hold the Northern Provincial Council elections is a step in the right direction.Let us hope that these elections will be free and fair and that they will be held as scheduled in September 2013. Difficult though it admittedly is, steps should be taken to follow due process with regard to bringing to justice some of the ex-senior LTTE cadres. Four years almost to the end of the war, we have not yet been able to identify those listed as missing or believed dead.This is a vital area on which we must move as speedily and as humanly as possible so that their next of kin could come to terms with their sense of loss. We should either press charges against those in custody or release them if there is no hard evidence to keep them in jail. This complex aspect of rehabilitation needs to be attended to responsibly and speedily if we are serious about helping those of our citizens overwhelmed by tragedy of war to apply closure. Parents need to know if some of their children are dead or alive; wives need to know the same of their husbands and vice versa and relatives need to know how many of their kith and kin have survived the war and how many perished. Then it was a case of waiting for the LLRC recommendations.These recommendations have, like the ides of March,come, but, happily, unlike the ides not yet gone.How much longer does Minister Peiris want us to wait for the ‘Government of this country’ to bestir itself to implement the LLRC recommendations, one wonders. The proposed Parliamentary Select Committee to aid in the search for an enduring political solution to the Sinhala-Tamil conflict or the National Question is yet to be appointed. In the pre-2009 period, admittedly the intransigence of the LTTE did not help the cause of a negotiated political solution. But today the LTTE is no longer an impediment to a marriage of true Sri Lankan minds. Hence the present delay in our national search for a true peace is both puzzling and troubling. The pressure from Geneva and elsewhere should therefore come as no surprise to us. These pressures stem from Sri Lanka’s neglect of home grown mechanisms for reconciliation for the formulation of which Sri Lanka asked for and received ‘time and space’. The LLRC laboured and produced its comprehensive recommendations unlike the APRC. Now instead of implementing these LLRC recommendations,like Oliver Twist of old, the Government is asking for more; more ‘time and space’ in which to do so. Likewise the government’s failure to act on similar assurances given to its citizens has been the catalyst for domestic discord, dissension and violence. Belated though it is, we have got to extricate ourselves from the enormous diplomatic hole we got ourselves into after May 2009 even at this late stage. This endeavour ought to be a national priority and this is a task that should not be entrusted to the Government or the politicians alone. There is, and has always to be a nexus between foreign policy and national or citizen interest. It is Sri Lanka, that is, all of us citizens, who will suffer far more than any government that is in office for a brief period, from our foreign policy lapses at any given time. Thus all of us citizens have a crucial role to perform to help resurrect Sri Lanka from the grave situation we have permitted our country to slip into. Our failure to perform our national role at this crucial juncture will only lead our country to further chaos and dissension. The time to act is now.